The traditional manufacturing process has not been able to achieve the finesse and the perfection that is done with the Selective Laser Sintering. This technology is one of the 3D printing techniques and has made a revolution in the sports industry. The technology has been to design the cleat plates for the football players and which weights around 5.6 oz and are designed to get the best out of them. The football athletes need to maintain their stance for the longer time on the field and hence the technology has come to their rescue. The Selective Laser Sintering has made it possible by the great engineering and the perfect shape that was not possible with the normal manufacturing process. This crafted plate is the world’s first 3D printed plate and the printing is done with the help of high powered lasers that can fuse the small particles of materials and make the 3 dimensional shapes. The cleat is called the Vapor Laser Talon Cleat. 3D Systems has made quite an innovation in the field of sports goods and equipments. This process just takes a few hours instead of months which were earlier needed in the previous manufacturing process. This innovation in the sports field has been possible with the 3D printing technology and the ability to print which was not possible early has been a boon in different industries. The companies can now print out of the box items which was a dream in the past. This light weight and fully functional plates has been designed with the rapid prototyping technology. 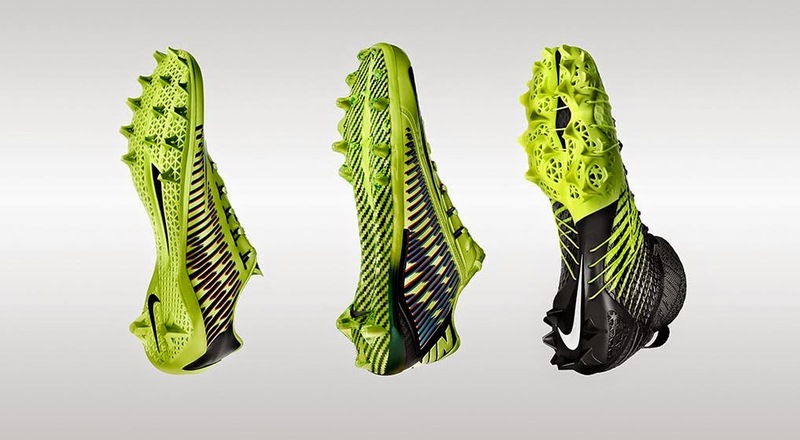 The benefits of the 3D printing these cleats are that it has reduced the manufacturing and printing time, editing and updating the designs is simple and the manufacturer saves time on the entire process.